Hydrangea quercifolia (the oakleaf hydrangea) and Hydrangea arborescens (the smooth hydrangea) are two species of hydrangea – both woody shrubs – that are native to the North American continent and have been grown commercially for landscape use. There are other species of hydrangea that have been introduced into landscape use – and there is one relative, the loosely-clinging vine Decumera barbara, which seems to be struggling for recognition as a garden plant – but the oakleaf and smooth hydrangeas are the most common North American representatives in the nursery trade. Hydrangea arborescens, represented by its cultivars ‘Grandiflora’ (referred to in older garden literature as "Hills-of-Snow" hydrangea), ‘Sterile’, and, more recently, White Dome (‘Dardom’) and ‘Annabelle’ (and her huge-flowering cousins like Incrediball), is probably the one North American hydrangea species that has seen general garden usage for the longest period of time. Both the smooth and oakleaf types come from moist woodlands of mixed hardwood trees and thrive in moisture-retentive soils that are high in organic matter (naturally, that would be decomposing leaf and twig litter found on the forest floor). However, in appearance these shrubs differ in their inflorescence form (creamy white cones of flowers that age to red and brown on H. quercifolia, and creamy white rounded dome or ball-shaped that age to silvery-tan on H. arborescens) and foliage display (thick, large oakleaf-shaped foliage on H. quercifolia, and thin, flat green leaves – that are prone to wilting in summer heat – on H. arborescens). These two species also differ in flowering time (early or midsummer), and when they develop their flower buds – this last characteristic determining when and how the plants can be pruned without damaging the flowering effect, and whether winter cold and late frosts might curtail the flower display. Hydrangea quercifolia is from a smaller region of the southeastern states (discovered by the early American botanist John Bartram) and is considered winter hardy in places as cold as -15F; it forms its new flower buds the year prior to each flowering season, so in the coldest areas in which it is considered hardy (USDA zone 5) it might not flower reliably (even if its foliar display is lush and lovely!). On the other hand, H. arborescens is native to moist rocky cliffs and seeps from New England to Missouri as well as southeastern states, and is probably more dependable for floral display because its flower buds form on new growth, that is, on a mass of stems that emerge (usually suckering from close to the ground) the current season. 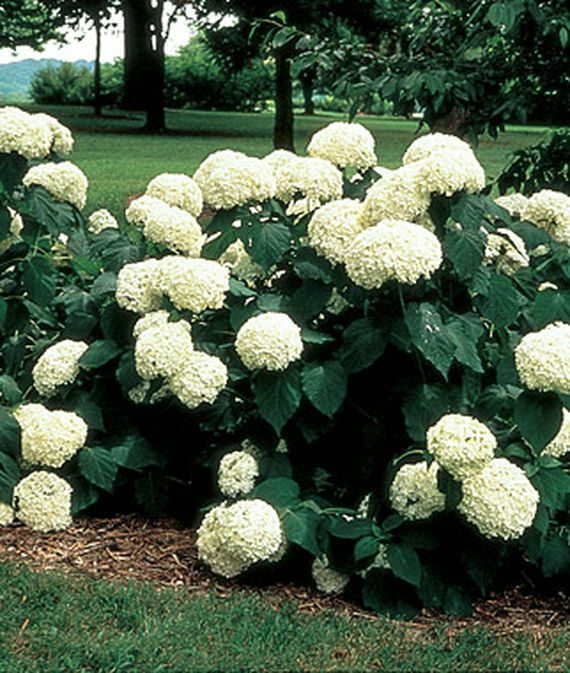 Because you can cut it to the ground each spring and expect vigorous new growth with a nice flower show that summer, H. arborescens is probably the easiest of the North American native hydrangeas to grow across a wider portion of the temperate world. It also tolerates wetter (that is, heavier clay or less "well-drained") soils and is winter-hardy in a colder zone or two (usually zone 4, but some references state H. arborescens survives in the warmest pockets of zone 3!). On the other hand, H. quercifolia is a more refined plant whose leaves turn a rich burgundy and orange color in autumn, and its coarse and craggy structure and peeling coppery-tan bark add interest to the landscape in winter, making it showy beyond its summer flowering season. Because it tends to wilt easily, the smooth hydrangea is best used in moister sites, especially if it is to bake in sun during the hottest time; its suckering habit also lends itself to massing and use as a summer hedge, whereas the oakleaf cultivars make excellent specimen plants and tolerate somewhat drier soil conditions if shaded from the hottest sun of the day.